Chelsea star David Luiz has said "every player" at the club believes in Maurizio Sarri's playing philosophy and is giving their utmost despite a dip in results at Stamford Bridge in recent months. "To play you have to be intelligent. We lived a few weeks of difficult moments and the players adapted very well. The manager adapted very well, the club adapted very well. "It was the decision of the club to change the style of football. For many years people said Chelsea were winning but never controlled the game. Now we control the game and people say we don't win. "It's about what we really believe. Every player believes in his philosophy and everyone is giving 100%." Luiz appeared alongside Sarri in a press conference ahead of Thursday's UEFA Europa League meeting with Dynamo Kiev, with Chelsea set to host their last-16 first leg before travelling to Ukraine one week later. Sarri's side look to be heading back into form, however, after recently beating Tottenham Hotspur 2-0 to consolidate sixth in the Premier League. Chelsea are one point and two points behind Arsenal (fifth) and Manchester United (fourth), respectively, but they have a game in hand. Sarri was criticised by some for his handling of Kepa Arrizabalaga's refusal to come off in the Carabao Cup final defeat to Manchester City on penalties, but concerns over their playing philosophy dig deeper into potential flaws. 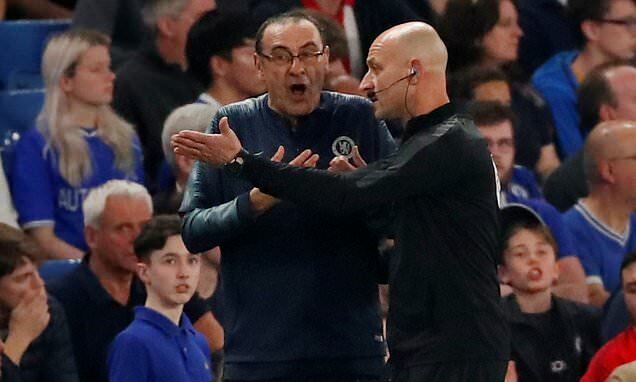 The club recently won back-to-back games in 90 minutes for the first time in 2019, beating Tottenham and Fulham, leading to suggestions there has been a change in Sarri's methods. However, Luiz said Chelsea "are still playing the same style" and added: "I don't think the style has changed. We just adapted some moments in the game, like the line to have high press or not." Reserve goalkeeper Willy Caballero stood in for Kepa during Chelsea's recent win over Tottenham, and the Argentinian said his side were "more together than ever" after their League Cup final loss to City, per Matt Law of the Telegraph. It's been a rocky transition for Chelsea this season. Sarri's predecessor, Antonio Conte, preferred to base his setup on the defence and promoted a philosophy more on a long ball game. The Blues are now buying into a pass-oriented style they'll hope will pay dividends down the line, and Chelsea hope to underline Sarri's strengths with a third consecutive win at home to Dynamo Kiev on Thursday.